From the moment the engagement ring is slipped on your fiancé’s finger, there’s one thing you can count on: unsolicited wedding advice. From your mom to your BFF to the cashier at Safeway, everyone has an opinion on how much money to spend on your wedding. You’ve probably gone to dozens of weddings with no idea how much they really cost. The reality might shock you. In over 500 weddings as a wedding photographer, I never sat down with a couple who said, “We have an unlimited budget.” Everyone has a budget, and everyone values different things. For example, while you may have a hefty photography budget, you might not care as much about fancy invitations. Discuss what you value most with your beloved before you start scheduling appointments with vendors. Here is some insider knowledge from a wedding vendor who’s seen enough to know what’s worth saving cash on, and what might not be. A planner may save your sanity by helping you through the major stages of the wedding planning and might even be able to wrangle deals with preferred vendors. I routinely threw in extra hours, special albums and other incentives to clients who were working with my favorite planner. Why? Because I knew their wedding was going to go smoothly and I would be able to kill it on their photos. I can’t even count how many times I’ve pinned on boutonnieres, directed guests on where to sit, dug out a sewing kit from my bag to repair a broken bustle and even cut a wedding cake when the bride and groom didn’t know they had to pay the catering staff to do it — all that banquet waitressing in college paid off. Cutting a wedding cake is no joke. I did these things because I was #teambrideandgroom, but guess what I wasn’t doing when I was doing all wedding planner stuff? My job. During those moments, my camera hung at my side while I did what I could to make sure the show went on. Not every planner is going to be there the entire day wearing a headset and carrying a clipboard ala J-Lo. 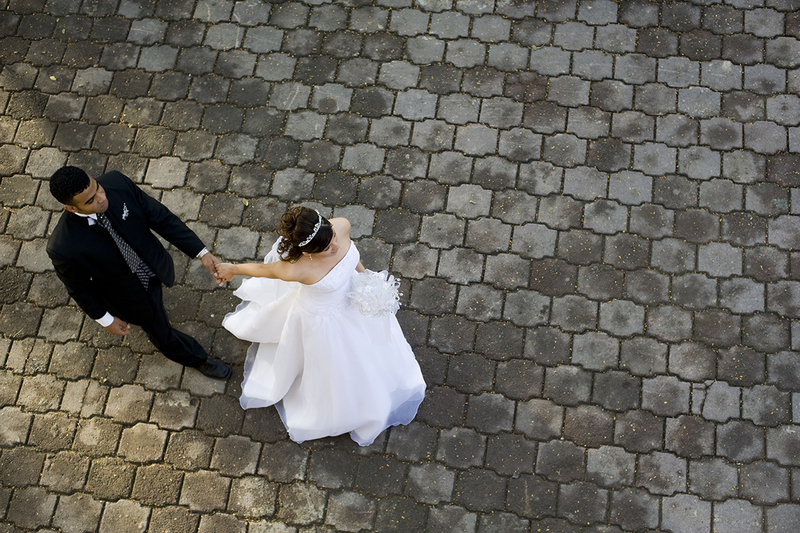 Many will offer their services in blocks of time that can help you with just planning the wedding and hiring vendors. Some also offer “day-of” services, meaning they will be at the wedding for part or all day. In any case, it’s worth a call to a few to feel them out and some even offer complimentary consults to see if it’s a good fit. Having a planner on board means that your vendors can do what they do best rather than running interference for the small but not insubstantial things that always go wrong on a wedding day. We know you’re pinning them. Those beautiful, elegant wedding photos of a bride and groom in a sunlit field without a hair out of place with gorgeous floral and baby goats dancing about. They’re called “styled photo shoots” and photographers and editors love them for magazine and blog content, but they are not real weddings. In real life, the bride and groom would be sweaty from the humidity, bitten by bugs and the goats would be eating the bride’s flowers. I once had a client who had visited a wedding mill photography studio where the “representative” assured her that it would be no problem to get a photo she really wanted in a park in front of a local bridge in Milwaukee. The only problem was, the photo she had shown them was from the Golden Gate Bridge in San Francisco. Even Prince Charming can’t turn the Hoan Bridge into the Golden Gate, and she was mortified that they hadn’t corrected her. There’s nothing wrong with using a photo from one of these managed editorials for inspiration for your own wedding, but be sure to manage your own expectations early on. The wedding industry is a multi-billion-dollar beast that always wants to show you the Cinderella story. On a wedding day, time is often at a premium. As we talked over timelines, my clients were often surprised at the time commitment it would take to get those beautiful, sun-drenched photos at sunset, which always seemed to coincide with dinner hour. There’s nothing that will make a catering manager more angry than a photographer who drags the couple outside for photos while the prime rib overcooks. This will vary by location, but some venues will offer discounts as much as 20 percent off the venue rental for off-season dates or non-Saturday weddings. Because “off-season” means something different in different areas, just ask the catering manager. While you may not always get a discount, they may offer an add-on such as a free champagne toast or hors d’ oeuvres for dates they would like to fill. If you find yourself increasingly stressed by the lists of people your parents insist you must invite, consider ditching traditional plans and embrace the tiny wedding movement. Or shorten your special day into a brunch wedding. Because the venue may be able to book two events in the same space on the same day, you may get a great deal. Your guests can rave about the Bloody Mary bar and omelets — and you can get to the airport in the early afternoon to jet off to your honeymoon. Please don’t try to disguise your wedding as a “party” to your vendors when you inquire about their services. Some couples actually try this tactic to save money because they have heard that vendors will increase prices for a wedding. It’s simply not true — and we know darn well that that 200 guest “garden party” on a Saturday in June is a wedding. A wedding is a once-in-a-lifetime event and has very specific needs. Similarly, using phrases like “reasonably priced” and “doesn’t cost an arm and a leg” when you inquire won’t garner you any favors. Do your research first to get an idea of the average cost of a service in your area. Set a budget and own it when you contact vendors. Start your conversation with what your budget is, what you might be willing to compromise on and go from there. Most wedding vendors are small businesses, so they appreciate honesty and want to work with people who give it to them straight. How hard do you think I worked for the bride in 2009 who cried alligator tears about her dying father and her limited budget, suckered me into a discount and when I showed up on the day she had eight ice sculptures, a stretch Hummer for the 23-person bridal party and fed me a cold turkey sandwich while her “dying” father grinded on the dance floor? Answer: Not very hard. Let’s just say she got some photos. Just like many industries, wedding industry people tend to know each other or at least have heard of each other and the reputations held in the area. Don’t be afraid to ask your venue, your photographer, florist, etc. for their referrals. Vendors will not steer you wrong because they want to work with people who make their jobs easier, who make them look good and who make you happy. If you have budget concerns, ask your vendors what you can do to reduce costs. Emily Neubauer, owner of Belle Fiori Florist in Milwaukee, Wisconsin, offers this advice for saving on your floral budget: “By letting your florist choose the most beautiful, fresh and seasonal flowers available in your aesthetic you will always get the best bang for your buck. “If you love Peonies and get married in late June, we can certainly source them for you, but they are going to be small, expensive, and certainly nothing like the showy blooms we see in May. Wedding trends come and go. 2013’s cupcake craze morphed into 2017’s doughnut craze. During wedding planning, you’re going to be barraged by the latest and greatest “must haves” in wedding blogs and magazines, and opinions from every “expert” (that is, your sister who got married in 2003) on what you should do to make your wedding perfect. It’s so easy to skip the wedding album so you can have the fancy Chivari chairs that you think will impress the guests or forgo the videographer so you can afford a food truck at midnight. When you are trying to figure out what is most important, think forward. In 10 years are you going to be proud of the fancy chairs (will your guests even remember them?) and the tacos, or would that video of your dad giving a speech mean more to you? There are only a few legal requirements to be married. These include a marriage license, a witness and someone to marry you — for around a few hundred bucks. Everything else is a “want.” With some savvy planning you can get what you want and still have that happily ever after. Kimberley Anderson is a newly retired wedding photographer who spent 20 years in the trenches. She still can’t believe how many things there are to do on a Saturday besides going to a wedding. Now you can find her helping local area wedding businesses with blogging and social media.